Google launched a new application for Apple's iPhone that uses voice recognition technology to enter queries in the company's search engine. The free app should be available now from the iPhone's App Store and through iTunes. The new apps lets iPhone users query Google outside the phone's built in Safari browser and also search through their contacts by using the phone's accelerometer and proximity sensors, the New York Times reports. Google's app can tell when you are lifting the phone up to your face and automatically triggers the voice recognition software that will process your voice and send it as a search query to Google. Processing your voice does not take place on the iPhone though. When you ask your phone a question, the sound is converted to a digital file and sent off to Google's servers, which will analyze the file and transform it into a search query. Then, the results are sent back to your iPhone. This whole process lasts reportedly only seconds, depending of course of the speed of the network you are connected to. Google's voice activated search app also uses iPhone features that let it determine your location. For example, you can ask "Where is the nearest Starbucks?" and the app detects where your are situated using the iPhone's location services, returning a list of the nearest shops. Google's app makes recommendations as well, and can return lists of restaurants and bars with starred reviews from Google users. The app also provides links to phone numbers and directions to the businesses listed in the results. 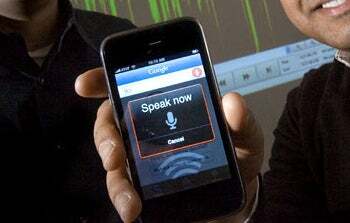 In addition, the new apps serves as a voice-powered contact search tool also. By saying the name of one of your contacts, the app brings up the relevant person's details. Then, to dial a result, you just click on the person's number. 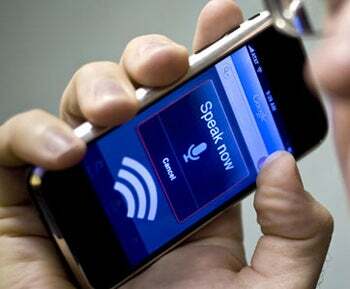 However, the Google researchers behind this application say that the voice recognition technology is only in its early days, and that users could get gibberish results at times. But the researchers hope that in the coming year this technology with evolve more rapidly, improving the quality of the results users get.